This model is a collaboration between designer Erik te Groen and myself, and builds into a 1:144 scale replica of Concorde. It may be built with landing gear extended or retracted and with the 'droop nose' in one of four configurations. The completed model is approximately 17 inches long with a wingspan of 7 inches. concorde144_instr.pdf - 231 KiB - This document contains the instructions only (8 pages). concorde144af_parts.pdf - 467 KiB - This document contains the parts for the Air France model (7 pages). The British Airways “Chatham Dockyard” parts document is available from Aries Paper Models (in the “Various” section). British Airways “Landor”: This scheme was applied to British Airways Concordes between 1985 and 1999.
concorde144ba_landor_parts.pdf - 544 KiB - This document contains the parts for the British Airways “Landor” model (7 pages). British Airways “Negus”: This scheme was applied to British Airways Concordes between 1976 and 1981.
concorde144ba_negus_parts.pdf - 928 KiB - This document contains the parts for the British Airways “Negus” model (7 pages). Singapore Airlines/British Airways dual livery : This scheme was applied to a Concorde in 1977 and from 1979 to 1980.
concorde144singapore_parts.pdf - 926 KiB - This document contains the parts for the Singapore Airlines/British Airways model (7 pages). Pepsi: In 1996 an Air France Concorde was painted in this blue livery for two weeks to promote the new Pepsi logo. concorde144pepsi_parts.pdf - 458 KiB - This document contains the parts for the Pepsi model (7 pages). Federal Express: A cargo version of Concorde was proposed for FedEx but never built. This is how it might have appeared. concorde144fedex_parts.pdf - 499 KiB - This document contains the parts for the FedEx model (7 pages). Air Canada: Four aircraft were optioned by Air Canada but later cancelled. 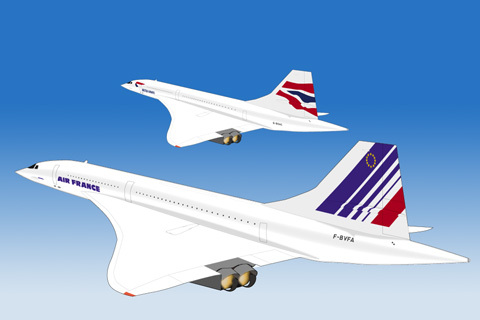 This is how their Concordes might have appeared if they were still in service today. concorde144aircan_parts.pdf - 1.1 MiB - This document contains the parts for the Air Canada model (7 pages). concorde_base.pdf - 712 KiB - This document contains the optional display base (1 page). The Concorde is among the most attractive and easily recognized aircraft ever built. It is the most successful of the two supersonic transport (SST) types to have entered service, and its graceful shape became a symbol of national pride for the countries that designed and manufactured it. Developed in the 1960s and entering service in 1976, the Concorde flew at over twice the speed of sound and could carry its passengers across the Atlantic in as little as three hours. In spite of initial interest by many airlines, only British Airways and Air France eventually bought the planes, with 14 in total entering service. Concorde's reputation as the world's safest passenger plane ended in 2000 when an Air France flight crashed on takeoff, killing all aboard and resulting in the grounding of the Concorde fleet. With safety improvements Concorde returned to service the next year, but rising operating costs and lower passenger numbers made it no longer economically viable. In 2003 both British Airways and Air France withdrew Concorde from service, and the surviving aircraft now rest in museums across Europe and North America. 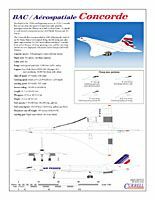 Concorde fact sheet (1 page, PDF format, 283 KiB). Click on the image to view. Concorde SST - one of the best sources of Concorde information on the web. Photo gallery - hundreds of photos taken throughout Concorde's history from the Airliners.net site.